My Christmas present to my readers. the tears still fell from my eyes. taken from the Dutchers lives worth while. 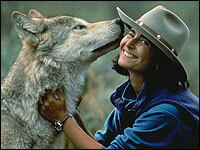 Due to their dedication over 50 wolves were re-introduced to the land in Idaho. This entry was tagged calming, Music, nature, spiritual, wilderness, Wolves. Bookmark the permalink. ← Lex Comes Home… Update. Hi again,You are so right, if only humans can follow the ways the wolves and dedicatetheir being to living and family just think how our world would be.Thank you for enjoying this song, Oliver Shanti is amazing artist and all his music is felt in the heart. bring your shovel there's still plenty here 😦 I hope you spoke to your family I know they would love sharing the time with you. HI Marcus,You can have all of my snow :DI am sick of it and winter just started :(I had a wonderful day with my daughter and her familyand even my sister joined .. a wonderful Christmas Hope your day was a great one also . Wow you made her day that's great I wish you could have gone home for it as wellbut maybe next year?